For some 48 hours running, people steadily streamed in and out of the palace grounds of the Kumba Paramount Ruler, Nfon Victor Esemingsongo Mukete. This was last weekend. And His Royal Highness, together with his seven sons, was performing this painful, this very tearful duty of burying his wife of more than five decades. It was difficult to keep an accurate count of how many people were to-ing and fro-ing at any particular point in time. Movement was as constant and fluid as a committed column of soldier ants. What could however, be easily ascertained, was the fact that from when the remains of the Queen Mother were laid in state, to when they were finally lowered to the bowels of the earth, there was always an estimated crowd of at least 15.000 mourners on the palace grounds at any point in time. Name them: the teeming K-Town masses, top-most administrative, religious and political leaders of the Southwest Province, Members of the Diplomatic Corps, Members of Government, friends of the Mukete family from all the nooks and corners of the Republic and beyond… and the list goes on. All this was in spite of the steady down pour of rain. Mrs. Hannah Ntoh Mukete, nee Makia died June 4, 2005 and her body had been preserved at the Buea District Hospital Mortuary until that weekend. She was the proud mother of seven boys, whom she reportedly brought up very responsibly. She reportedly attached the greatest importance to education and spared no effort in seeing that all those for whom her husband had responsibility, took their education seriously. Family sources indicated that she made many sacrifices for the education of her sons, none of whom depends on the civil service for a job today. She was a strict disciplinarian, but loving mother, who achieved remarkable success in raising her family. After Chief Mukete's Ministerial period in Lagos came to an end, she spent 22 years as wife of the Chairman of the Cameroon Development Corporation, CDC. The Muketes had got to the CDC at a time when Europeans filled all the senior posts. There had not been an African Chairman before, but the exposure to the circumstances in Nigeria had prepared her for any social situation. More so, the long period in CDC offered her many opportunities to travel to various parts of the world in the company of her husband and her robust constitution enabled her sometimes to even accompany him on field trips, especially in Malaysia in the Far East, where they would visit oil palm and rubber estates and factories. She then proceeded to Edgerly Memorial Girls School in Calabar, a Church of Scotland Mission Foundation. It was here she met her husband Victor Mukete, who was then a student of the Yaba Higher College-Lagos. Late Hannah later joined her husband in Bamenda where he was serving as an Assistant Agricultural Officer at the Government Agricultural Experimental Station in Bambui. After a short while in Bamenda, the couple proceeded on transfer to the School of Agriculture in Nigeria. 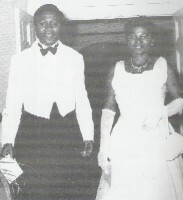 The late Hannah was to later join her husband in England, where she did a dressmaking course and participated in the Cameroon Association of Great Britain and Ireland. They returned to Nigeria where they spent five years. She played an active political life; she was a committed Christian and astute entrepreneur. As earlier indicated, during her 58 years of marriage, she was blessed with seven sons, all living, 23 grand children and three great grand children. In a thanksgiving sacrifice officiated by the Moderator of the Presbyterian Church in Cameroon, the Rt. Rev. Nyansako-Ni-Nku, said death does not discriminate, for, all must one day die. Quoting from the gospel according to St. Job in the Bible, the Moderator said if death was discriminatory, then only the poor would be dieing. He warned that the life of everyone else is in their hands, depending on how they live on earth. He regretted that some people are craving for money, position, and property, and have no time to spend with God. "Position and other earthly things shall not save you because there's life after death. Where, therefore, shall you spent eternity?" he asked adding that all must live a Godly life because every one shall give account to God for the life they spent on earth.